Perfecto label boss Paul Oakenfold teams up with pop star Matt Goss to create a follow up to their single ‘Firefly’, which was released on Perfecto Records in 2010. 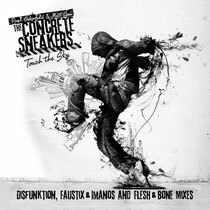 Here, under their brand new alias The Concrete Sneakers they’ve created “Touch The Sky”, a crossover vocal track that has already generated support on both radio and in clubs. For this release Dutch electro house producers Disfunktion turn in a remix that Paul Oakenfold has been hammering on all of his recent shows including all of the warm up slots he has been playing in support of Madonna on her North and South American MDNA tour dates. On remix duties are Faustix & Imanos, two up coming producers to watch out for in 2013. With current releases on Strictly Rhythm and Red Stick Recordings (that featured a massive Tommy Sunshine Remix) plus their own remix of the club hit ‘Burning’ by Adrian Lux they are fast developing a wide fan-base with both clubbers and reputable labels. Last up are Oakenfold favourites, Flesh & Bone, who take a slightly more laid back and melodic route. It’s out tomorrow on Beatport.